Pro Tools | Flux Elixir & BitterSweet Version 3 - AAX Native/DSP Compatible!!! Flux Elixir & BitterSweet Version 3 - AAX Native/DSP Compatible!!! Flux have started to release their plug-ins in Avid’s AAX format, and have announced the freeware BitterSweet v3 transient plug-in in AAX Native format and their true peak mastering limiter Elixir v3 in both AAX Native and DSP formats. This is what they say…. Today, we are finally starting to release the AAX (Native & DSP) and 64-bit compatible versions of our software, built on our latest 64-bit version 3 framework, hereafter called v3. First out is the FREE BitterSweet v3 Transient Designer, and the Elixir v3 True Peak Limiter, and now when we have the framework ready, we are aiming at having all our software ported and available within Q1 this year. The v3 framework improves the performance dramatically (measured 500-1000 percent improvement for Elixir depending on host environment!) and for the graphic rendering the v3 framework includes our GPU-efficient 2D/3D graphic engine, first introduced in the Pure Analyzer System, based on the OpenGL standard optimizing the audio-to-visual experience utilizing the GPU on the computer’s built in graphics card. 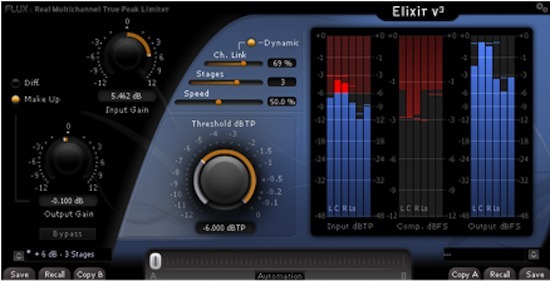 The update to the 64-bit compatible and to the AAX Native version (AU/VST/AAX Native) is Free of charge for all current owners of Elixir, and can be downloaded when logged in to the customer download area on our website. If you’re not using Elixir yet, a dongle free trial version is available on our download page as well. I used Elixir v3 today on a project and it is great to at last have a broadcast true peak limiter available to run on my very underused HDX card. In fact today’s was the first project I have done entirely in AAX DSP, using the Avid Channel Strip, EQIII and the Flux Elixir. I look forward to the rest of the Flux range especially the Epure EQ in DSP form. The prices are already available and you can buy these from the Flux store. All existing owners of the Native version of Elixir will get a free upgrade to v3 Native.